^ 1.0 1.1 Fox apologises for Williams gesture. BBC News. 15 June 2018 [15 June 2018]. （原始内容存档于15 June 2018）. ^ The One And Only. BBC. 2008-01-05. ^ Amanda Andrews and Adam Sherwin. Shake-up starts at EMI with departure of UK chief. Times Online. 2008-01-09. ^ Robbie Williams Enters The Guinness Book of World Records 互联网档案馆的存檔，存档日期2014-10-06. ^ The BRIT Awards 2005. BRIT Awards. （原始内容存档于2007-07-02）. ^ Echo-Verleihung mit hohem Kreischfaktor. Rhein-Zeitung Online （德语）. 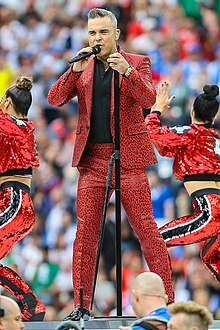 ^ Robbie joins UK pop Hall of Fame. BBC NEWS. 2004年11月12日. ^ UK's 100 best-selling. Times Online. [2006-11-26]. ^ Sunday Times Rich List 2006. Sunday Times. 2006. ^ BBC Stoke & Staffordshire - Robbie buys into Vale. [2006-12-17]. ^ 罗比威廉姆斯世界杯开幕式当众竖中指 播出方道歉. 新浪. 2018-06-15 [2018-06-16]. （原始内容存档于2018-06-16） （中文（中国大陆）‎）.